Replacement lid only fits our newly designed 50oz large square containers (with logo etched on container base). Replacement lid fits all of our 30oz square stainless steel containers. Replacement lid fits all of our 30oz square containers. Replacement lid fits all of our 15oz square stainless steel containers. Replacement lid fits all of our 15oz square containers. Replacement lid only fits our newly designed 25oz rectangle stainless steel containers (with logo etched on container base). Replacement lid for our 16oz round stainless steel containers. Replacement lid for our 9oz round stainless steel containers. Replacement lid for our 5oz round stainless steel containers. Replacement sip-through lid for our 8oz and 12oz stainless steel insulated tumblers. Replacement lid for our leak-proof stainless steel insulated food jars. Extend the life of your reusable food-storage containers, tumblers and food jars by purchasing a new lid to replace lost ones. 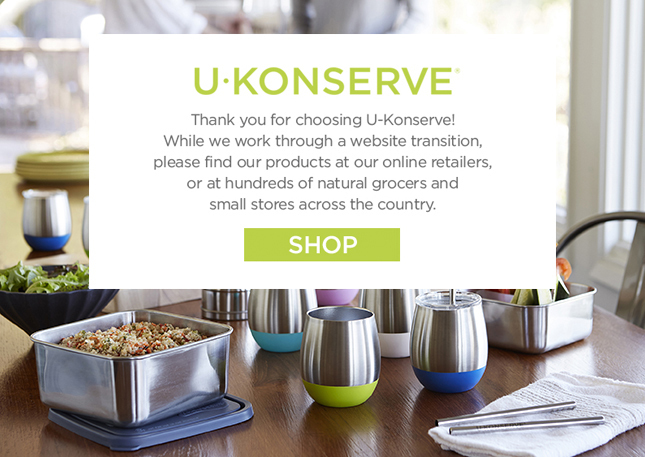 Replacement lids are available in several colors and multiple sizes that fit on U-Konserve containers, nesting sets and jars.